Game of Thrones fans have never seen Westeros like this before. In January 2019 in Berlin, Germany, more than 40 Game of Thrones concept artists will come together to debut the artwork they created to chronicle the origins of Westeros during an exhibition called Unseen Westeros. Endorsed by George R.R. Martin himself, Unseen Westeros is scheduled to take place from January 23 to January 27, 2019. The exhibition is completely free to those interested in attending, due in large part to the Unseen Westeros Kickstarter campaign, which Game of Thrones fans have contributed upwards of $26,000 to as of this writing. These artists, who have been working on concept art for the beloved television series since 2015, produced 80 new and unseen scenes that illustrate the entire pre-story of Game of Thrones and feature 50 never-before-seen locations included in The World of Ice & Fire, the A Song of Ice and Fire novel series companion book written by Martin, Elio M. García Jr, and Linda Antonsson. We're thrilled to share five of these paintings — created by Kristin Johnson, Eve Ventrue, Jimmy Przemek Duda, Rene Borst, and Tom Hiebler — exclusively here on Looper. Check them out, along with quotes from the artists, below. With its citrus trees and spice plants, the lush greenery of the Water Gardens palace, and the gilded architecture of its capital of Sunspear, Dorne is one of the most beautiful locations in the Game of Thrones lore. Though Dorne lies in Westeros, in the southernmost part of the continent, it actually used to connect to Essos, the home of the Free Cities, the Kingdom of Sarnor, and the Dothraki Sea. A strip of land known as the Arm of Dorne linked Westeros to Essos via Dorne 12,000 years prior to the start of the Game of Thrones story. Now, however, the Arm of Dorne is no longer. An archipelago called the Stepstones remain where the Arm of Dorne once was, with the severed Westerosi side of the Arm of Dorne now known as the Broken Arm. 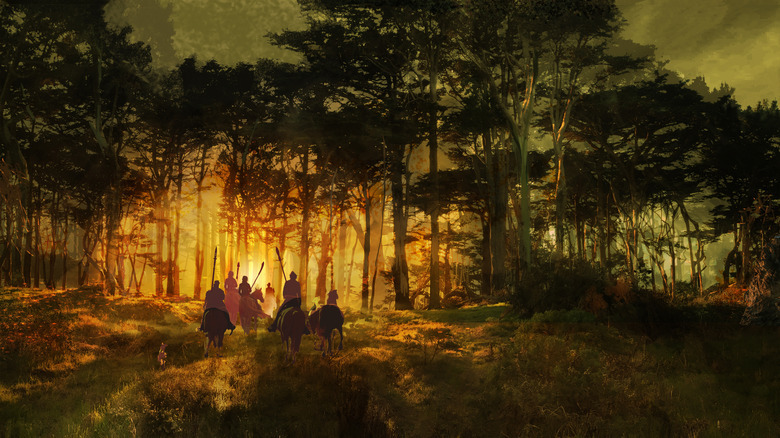 In her painting of the Arm of Dorne, artist Kristin Johnson depicted the First Men making their way through the land to complete their journey from Essos to Westeros. Johnson provided insightful context for her gold-and-green-hued piece: "Around 12,000 years ago, the First Men came to Westeros from Essos by crossing the Arm of Dorne. When the First Men and the Children of the Forest first went to war, the old songs say greenseers of the Children used dark magics to make the seas rise and sweep away the land, shattering the Arm, in a futile attempt to end the invasion of the First Men." 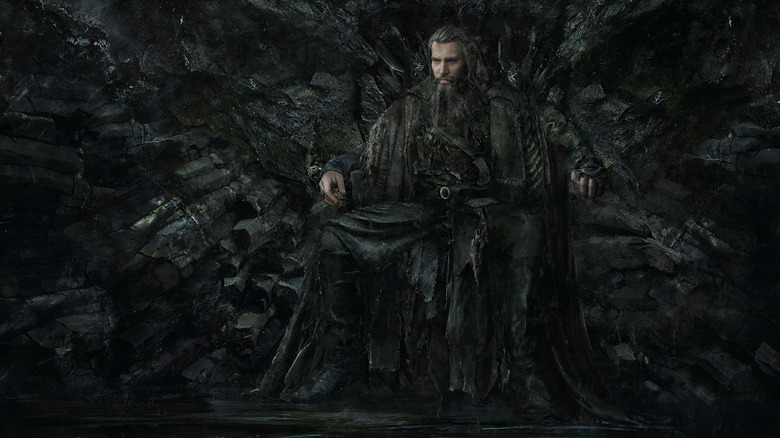 Game of Thrones loyals know all about the Mad King, the King in the North, and the King of the Iron Islands, but one king they haven't yet become acquainted with on the small screen is the Grey King. Eve Venture crafted a gorgeous, photorealistic painting of the Grey King to offer an idea of what the Storm God-fighting, Drowned God-battling, sea dragon-slaying ruler looks like. 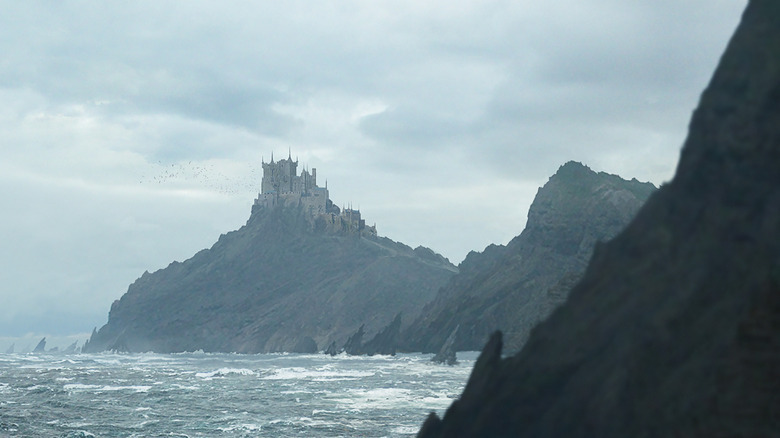 Ventrue explained that the legendary ironborn monarch of the Iron Islands "is said to have ruled for 1,007 years" and that house Greyjoy of Pike, along with "all of the great houses of the islands," claim to have descended from the Grey King. Every Game of Thrones fan remembers the pre-season 7 theory that speculated Jon Snow (Kit Harington) would go up against giant ice spiders. They can also recall the time Old Nan (Margaret John) told little Bran Stark (Isaac Hempstead Wright) about the first time the White Walkers moved through the woods and reared their spiky blue heads. The creatures rode in on the backs of dead horses, Old Nan said, and used "packs of pale spiders, big as hounds" to attack humans. Season 7 didn't feature these horrifying beasts, but thanks to artist Jimmy Przemek Duda, we have an idea of what they may have looked like on Game of Thrones. 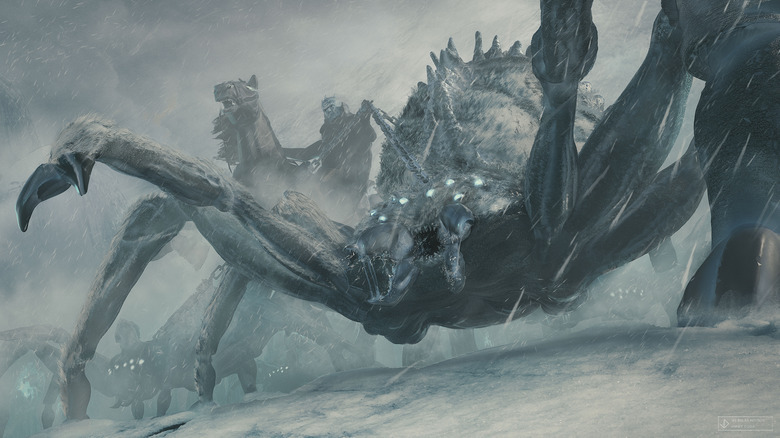 "The Ice Spiders were a fearsome and effective military unit of the Others [the White Walkers] during the Long Night. Though big and strong enough to be used as mounts, it would be even better to see them being chained and held by a warrior riding a dead horse, furious from hunger and thirsty for blood," said Duda of his painting. "They would be released from their leashes to viciously attack their victims like a pack of hounds." Nestled in the North of Westeros on a peninsula to the southeast of Winterfell, Widow's Watch is the castle and the seat of House Flint, one of several vassal houses allegiant to House Stark. It sits on a patch of land that juts out into the Bite, an inlet of the Shivering Sea that's home to the Three Sisters islands. Game of Thrones fans didn't get to see Widow's Watch on the show, although the castle did appear on a map Roose Bolton (Michael McElhatton) held on the season 4 episode "The Lion and the Rose." Rene Borst was taken with Widow's Watch and its figuratively and literally icy atmosphere, and so he chose to paint it. Borst pulled inspiration from elements of Renaissance-era clothing, Scottish castles, and Irish, Scottish, and Scandinavian landscapes to create his painting "Widow's Watch." "I really liked the location of Widow's Watch. The big stronghold in the north on the rough coast at the Shivering Sea reminded me a lot of the landscapes from Iceland, Scotland, and Scandinavia," said Borst. "I tried to keep that cold, rough feeling in the image. For the shape of the castle, I did want something solid and strong but also [with] filigree, so I came up with a design inspired by dresses of the Renaissance (Queen Elizabeth of England) and Scottish castles." 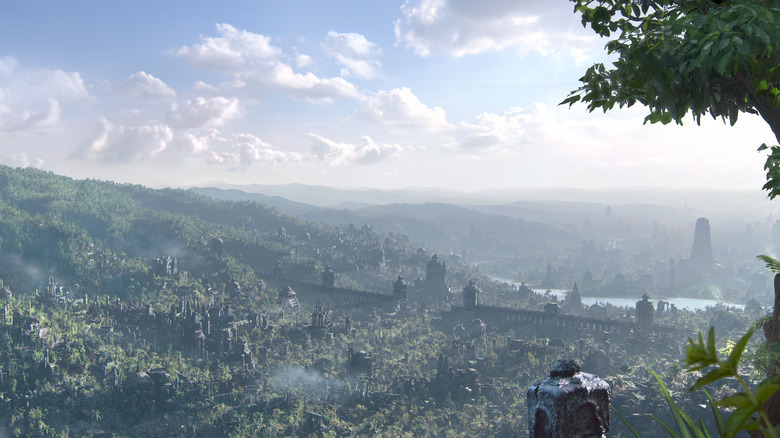 Situated along the Zamoyos river in the Sothoryos continent is Yeen, a city built from massive black stones that, according to The World of Ice & Fire, would take a horde of elephants to move (via The Hollywood Reporter). Yeen is believed to be older than the port city Asshai, and has been in ruins for thousands of years. Many have attempted to recolonize Yeen, though all settlers who tried vanished without a trace. The little that is known about Yeen only adds to its mystery: the Rhoynar who settled in Yeen in the past had to battle "brindled ghouls" (a.k.a the Sothoryi, the Brindled Men) and the jungle that wraps around Yeen has shied away from the city, as if in fear. Artist Tom Hiebler sought to capture the enigmatic quality of Yeen in his painting aptly titled "Yeen." "There is not much known about Yeen. Jungle, black stone ruins, a river," Hiebler wrote of his work. "My personal claim was to deliver a super photorealistic image, in which I can feel the jungle, the heat, the moisture emanating from it. The jungle should be endless, the stone buildings gigantic." Still, in all the grandeur that evokes danger, Hiebler wanted to demonstrate that Yeen may not be as terrifying as the tales say. "Nevertheless, a positive feeling should emanate from this city," he said.